The Spectrum 23 Call for Entries opens on October 19, 2015. This is an invitation to all professional and student artists, art directors, publishers and artist representatives to submit entries to the 23rd Annual Spectrum International Competition for Fantastic Art.. 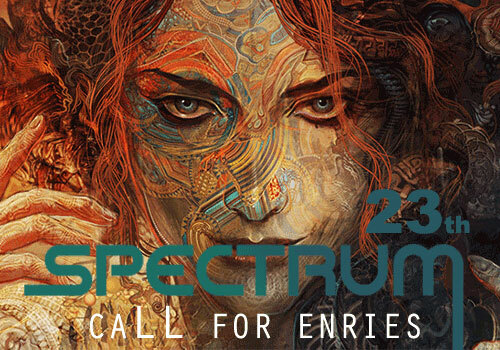 This is an invitation to all professional and student artists, art directors, publishers and artist representatives to submit entries to the 23rd Annual Spectrum International Competition for Fantastic Art. All art works in all mediums embracing the themes of science fiction, fantasy, horror, and the surreal are eligible for this show. Fantastic Art can be subtle or obvious, traditional or off-the-wall, painted, sculpted, done digitally or photographed: there is no unacceptable way to create art and there are no set rules that say one piece qualifies while another does not. Imagination and skill are what matters. Work chosen by the jury will be printed in full color in the Spectrum annual, the peer-selected "best of the year" collection for the fantastic arts. no later than January 25, 2016. (For Express Mail, UPS, Federal Express, etc., please check the "No Signature Required" option.) The judging will take place shortly after the deadline. Only entrants whose works are selected by the jury for inclusion will be notified in April 2016 by email, with additional information regarding what we'll need for the book. A list of accepted entrants will also be posted on the Spectrum website, www.spectrumfantasticart.com. Please check to see if your name is on the list before contacting us to ask if you made it. We will not be notifying entrants who did not have work selected: Only artists with work selected by the jury for inclusion in the annual will have their names listed on the website and will be notified by email. Give your work a fair chance at being selected for inclusion in the book. Try to submit the best-quality representation of your art possible. No, don't spend an arm and a leg on color-corrected prints, but DO make sure the submission is in focus, isn't the size of a postage stamp and doesn't look like it was photographed in the fog. Entries are NOT prescreened: ALL entries will be reviewed by the jury. Each accepted entry will be reproduced in full color and given complete credit in the twenty-third Spectrum annual; the contact information for all artists or their agent/representatives will be printed in the artist index. The person who has submitted an accepted entry will receive a complimentary copy of the annual. International residents are required to pay shipping. Tear sheets are not available. Additional copies may be purchased at a discount.